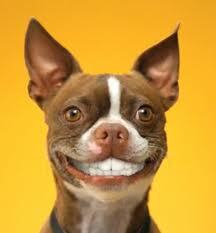 We’re All Smiles at Fit’n’Furry Pet Resort! We all see the commercials. Those perfect, well groomed canine specimens lying on the white carpet calmly nibbling on their new treats mom or dad just bought at the local store. But wait! There’s more! These yummy treats help clean teeth and prevent tartar as well as fight gum disease! Hurry to your closest pet store to grab your bag today! But are these “dental sticks” and treats really all that they’re hyped up to be? Fit’n’Furry is on the case getting down to the “root” of the question: Are these products truly an effective way to keep your pet’s teeth clean? First of all, to help prevent tooth and gum issues, make sure you are feeding Fido an appropriate diet of dry, crunchy kibble. Soft, wet food and people snacks gets stuck along the gum line much more easily. This contributes to plaque buildup which then leads to tartar that will devastate the gum line. According to dogdentalcare.net, once the gum line has been destroyed and/or diseased, the dog can lose teeth, ensuring the need for professional dental care. Bacteria from the diseased gums can also infect organs via the pet’s bloodstream. If you’re able to, frequent brushing of Fido’s teeth is a great way to avoid dental (as well as internal) complications. Many grooming facilities offer teeth brushing with their services if you’re not able to at home. Natural bones and even Nylabones (make sure the product is toxin-free) are easy and entertaining ways to scrub and scrape away plaque but not as effective as brushing. 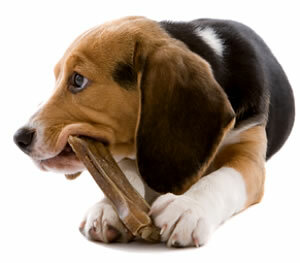 When giving natural bones, be mindful that Fido doesn’t snap off a piece and swallow. Natural bones can also cause tooth fracture. So, are those wonderfully marketed “dental treats” as effective as frequent teeth brushing? No. But they still benefit Fido’s dental health! Fit’n’Furry found on pets.webmd.com that coating treats with a substance called polyphosphate reduces tartar by 55% (Some treats claim to reduce tartar buildup by 80%!). The coating prevents plaque from turning into tartar by isolating calcium on teeth. The Veterinary Oral Health Council (VOHC) is an organization that evaluates pet products to see if they meet standards for reducing plaque or tartar. Only purchase treats that have been approved by the VOHC and adhere to your pet’s breed and dietary needs. For a list, please visit: www.vohc.org/accepted_products.htm . The m-“oral” (Or perhaps, the “molar”) of the story is, don’t rely on dental treats alone for Fido’s teeth and gums’ well-being. Learn how to brush your pet’s teeth, take him to a groomer or visit a pet dentist regularly (just like we would make a dental appointment ourselves). But to keep up the good work in between appointments, these popular dental treats are delectable, amusing and are a great purchase. 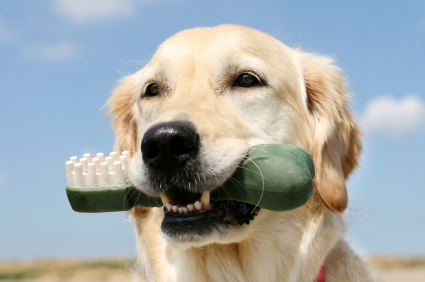 Don’t forget, good oral hygiene can add years to your pet’s life span!